I was searching for something ‘Fun” for this Friday’s post and happened upon this great quote. I thought, what a fantastic way to add to this overused saying on failure. Can you imagine how many times this man, the inventor of the telephone, had to look for other ways to get where he wanted to go, to see his vision come to fruition? 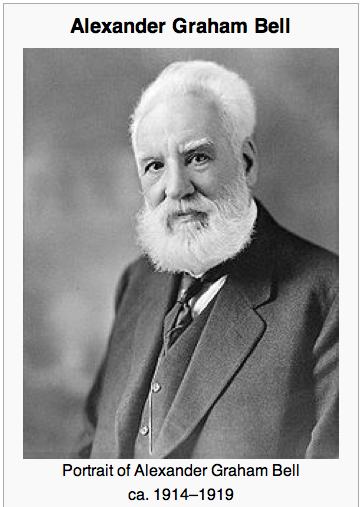 Alexander Graham Bell holds 30 patents (18 solely)! If he spent his time focusing on all that WASN’T working you can bet that number would be far lower or any at all. Bell is an interesting fellow and someone we can look to for inspiration when what we envision doesn’t come to be in quite the way we had hoped. Let A.G.B. be your example. Start to be open and see all your doors. Realize that every thing is happening FOR you. Each ‘closed door’ is an opportunity to something different, something greater. Every time you pick up your (tele)phone this week use it as an reminder to look for new possibilities. Sending you lots of love this Monday, My Fierce Friends! This entry was posted in FIERCE FUN, FIERCE SOUL, FIERCE- ISH by GETFIERCE TRAINING. Bookmark the permalink.